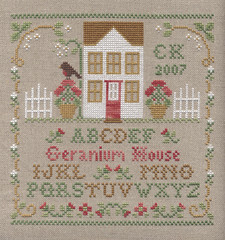 I finished Geranium House earlier tonight. It really was a fun stitch. I love it. I’ll probably have it framed but it it could be a lovely pillow too. Unfortunately I have been gripping my Qsnaps too tightly and my hands are really sore, so tomorrow I am going to have to take the day off and go shopping or get to grips with the housework (nooo!). Joel asked me the other night where the G and H were on the alphabet – I hadn’t noticed they weren’t there and that was the point of the title. He’s an observant one, my boy.